Two sets of two flute panelled door cutters with either a round over or flat ovolo profile. Each set consists of a pair of cutters, one for the profile and one for the scribe, although each cutter may also be purchased separately as spare parts. The cutters can be used for producing door frames for panelled doors and for any other joinery or cabinet work requiring a panelled frame construction. The cutters are supplied with an application sheet detailing their use, which is available separately on request. They are suitable for use on timber with a thickness between 19mm and 25mm. These cutters are suitable for use on machines with a power rating of at least 750 watts and are available in 1/2" shank only. Spare parts should be selected from this table and then ordered from the Bearings and Spares section of the catalogue. 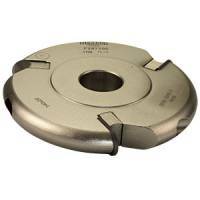 For complete cutter assemblies see Round/Ovolo Spares section.